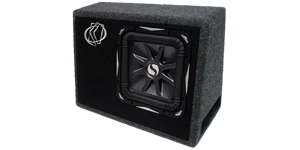 Home > Kicker > Enclosures > Single 10"
Check out our Kicker pre-loaded Single 10" sub box enclosures! These matched subwoofer and box packages are designed and engineered by Kicker so you can expect the maximum performance and sound quality! We have the sub boxes in both 2 and 4 Ohm versions available. We have loaded 10" packages in everything including the Kicker COMP, CVT, L5 and L7 available to fit any listening style.